MOSCOW — Syrian President Bashar Assad was asked to come to Russia to get him to agree to potential peace initiatives drafted by Russia, Iran and Turkey as Russia prepares to scale down its military presence in the country’s civil war, the Kremlin said Tuesday. Vladimir Putin hosted his Syrian counterpart in the Black Sea resort of Sochi on Monday, ahead of a summit between Russia, Turkey and Iran and a new round of Syria peace talks in Geneva. The meeting was unannounced and the Kremlin did not make it public until Tuesday morning. “I passed to (Putin) and all Russian people our greetings and gratitude for all of the efforts that Russia made to save our country,” Assad told Russia’s top brass. Assad has only ventured outside his nation twice since the conflict began — both times to Russia. This week’s visit to meet Putin is his second since the crisis began in March 2011, leading to a civil war that has killed some 400,000 and resulted in millions of refugees. The first was in October 2015, shortly after Russia launched its military campaign in Syria to shore up Assad’s forces, which turned the war in favor of Assad. The meeting in Sochi, which lasted three hours, came ahead of a summit at the same place between the presidents of Iran, Russia and Turkey. Iran and Russia have been Assad’s main backers while Turkey supports the opposition. Putin had spoken with the leaders of Iran and Turkey to “assure them that Russia will work with Syrian leadership to prepare the groundwork for possible understandings” that could be reached on Wednesday to “make sure” that agreements reached will be “viable,” Dmitry Peskov, Putin’s spokesman, told reporters on Tuesday. The White House said President Donald Trump spoke with Putin over the phone Tuesday, and that Syria, Iran, North Korea and Ukraine were on the agenda. Asked whether Putin and Assad have talked about the Syrian president’s future in post-war Syria, Peskov said “possible options for political settlement have been discussed.” Faced with pressure from other nations urging Assad to step down, Moscow has insisted that it is up to the Syrian people to vote Assad in or out. In an another apparent step in laying the groundwork for Wednesday’s meeting, military chiefs of Russia, Turkey and Iran met in Sochi on Tuesday and agreed to coordinate their efforts in Syria. The Russian defense ministry said the chiefs of the General Staff of the three countries gathered in Sochi to discuss “concrete steps to complete the elimination of the remaining IS and Nusra Front formations” in Syria, referring to Islamic State fighters and Syria’s al-Qaida affiliate as it was formerly known. The three officials also agreed to improve coordination in a safety zone in the Idlib province in Syria’s northwest. Russia, Turkey and Iran earlier this year brokered a truce between Syria’s government and the rebels in four areas in Syria, including Idlib. 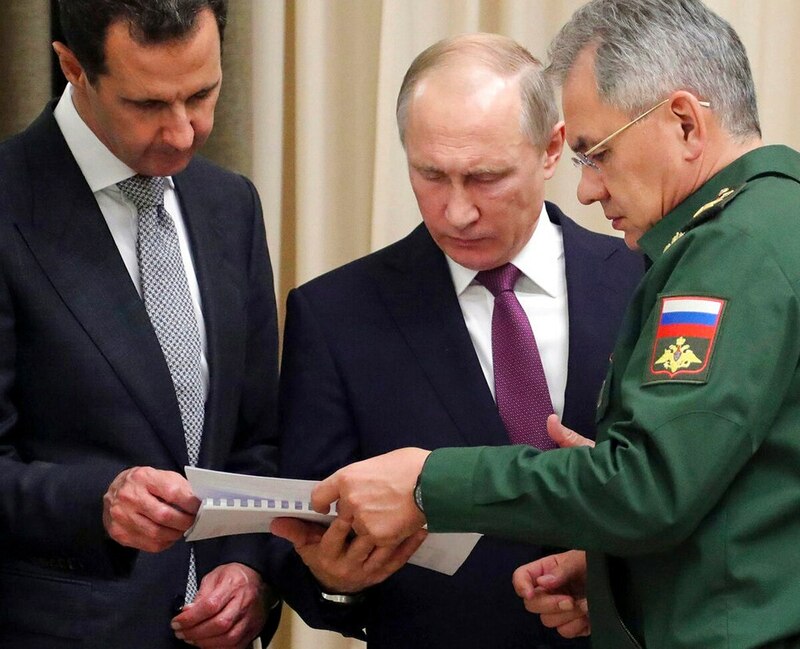 With the Syrian government controlling most of the country and Islamic State fighters in disarray, Putin told Assad at the Monday meeting that Moscow is about to curtail its military presence there. The Kremlin has announced scale-downs and a halt in its operation in Syria before but did not follow through. Putin in March 2016 ordered that a withdrawal from Syria, saying “all the tasks have been accomplished.” In January, Russia said it is pulling out its aircraft carrier and other warships from the waters off Syria. Russia continued to operate warships off the Syrian shore as late as this fall. Footage and photographs released by the Kremlin press office showed Putin giving Assad a warm embrace upon his arrival at Putin’s residence in Sochi. Assad said the Russian Air Force helped Syrian troops in the fight against insurgents, helping many Syrians to return to their homes. “In the name of the Syrian people, I greet you and thank you all, every Russian officer, fighter and pilot that took part in this war,” Assad said. The meeting came two days after Syrian troops and their allies captured the eastern town of Boukamal, the last major inhabited area held by the Islamic State group in Syria. Syrian troops and their Iran-backed allies marched into the town under the cover of Russian airstrikes.